1 Pour boiling water over ancho chili peppers; let stand covered 10 minutes. Remove peppers from water and discard water. Process peppers, honey, vinegar and onion in blender or food processor until smooth. Turn into medium bowl. Stir in Hellmann's® or Best Foods® Mayonnaise Dressing with Olive Oil. Reserve 1/3 of the Mayonnaise Dressing mixture. 2 Grill or broil salmon, turning once and brushing with remaining Mayonnaise Dressing mixture, until salmon flakes with a fork, about 15 minutes. 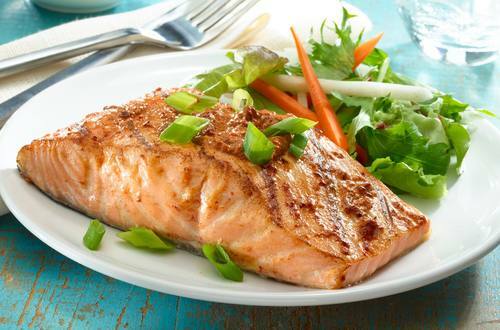 Serve salmon with reserved Mayonnaise Dressing mixture and garnish, if desired, with additional chopped green onions.